"We were not made to exist in the outside world. Let's go home." There's virtually no question that the animated film Akira pretty much brought Japanese anime to North America, and to much of the world. While Japanese comics enjoyed cult popularity by those who were already collectors and fans of animation art, the market for it, prior to the late 1980s, was not very big and it was often hard to find translated manga. When Akira exploded onto the Japanese scene, the massive following it gained, as well as critical praise, brought it to the U.S. as the "next big thing." Sure enough, it was an enormous hit and it blew most people away—those who had never seen the more 'mature' world of anime and assumed all feature cartoons came from Disney. Anime began to catch on. Video stores started actually carrying the material, then making separate sections for it, until slowly, but surely, it became a respected genre. Now, it's everywhere, even on Saturday morning television. Icons like Bugs Bunny and Scooby-Doo used to dominate the scene; now they have to sharetime with Pikachu and Sailor Moon. Akira pretty much gave birth to this movement, at least, as far as the U.S. is concerned. As such, it's considered one of the most important animated films of all time, and with good reason. In Japan, Akira already enjoyed an established reputation as a comic book series (currently being republished in large volumes by Dark Horse Comics, here in the U.S.) and was considered to have exceptional storytelling and craftsmanship. Nowadays, Japanese cartoons are widely popular on DVD, and it's the perfect medium for an artform that has often caused debates in the past about dubbing versus subtitling, and proper aspect ratio. Sadly, Akira remained missing-in-action until now, but the wait now seems worth it. Akira takes place in the year 2019, some years after the conclusion of World War III. Tokyo was destroyed during the war by some kind of misfiring, experimental weapon. Now, 30 years later, Neo Tokyo exists on the remains of the old city. The government is incredibly fascist and corrupt, and the military still performs secret experiments in the hopes of discovering an "ultimate" weapon. Crime and discontent is rampant, despite advanced technology, and the people are constantly at war with police and terrorist factions. The story follows a small motorcycle gang led by Kaneda who, like most teenagers in Neo Tokyo, tend to avoid school, reject authority, and cause trouble. Kaneda's friend Tetsuo is considered the "child" of the group and is often treated like he's not really a full member. Their lives all change, though, when Tetsuo gets into a serious accident, almost hitting a small child with his cycle. Since the child is an escapee from a government experiment, Tetsuo is hospitalized by the military where they discover that he harbors psychic powers. So, without his consent, Tetsuo is inducted into the same government experiments using psychically gifted children that virtually destroyed the world 30 years ago. What or who is Akira? It is a mystery that few people understand, but Tetsuo will eventually discover the answer, as his power is forced out by the government. Meanwhile, Kaneda tries to ally himself with anti-government rebels so that he can save Tetsuo. As might already be apparent, Akira is not a simple action/adventure story, though there is plenty of excitement to be had. It's a multi-layered piece that covers a variety of themes, from the horrors of uncontrollable weapons to the problems that emotional isolation can cause in children. The future is presented as a very real place, one that could quite possibly face Japan in the distant future. Like any good author, Katsuhiro Otomo knows where to stop being "futuristic" where to allow the story to turn more human and personal; this, I feel, more than anything else, is what has earned Akira it's devoted following. Certainly a casual viewer can enjoy the film on a very basic level, but the lofty plot makes it more intelligent than a simple "kill the bad guy" type of plot. On the reverse side, Akira was also condemned by many for it's brutal nature and extremely gory presentation of violence. I will agree that Akira is violent, I've never really agreed that this was done to be exploitative. Certainly anime has produced much worse with far less story and crafting. One thing that always impressed me is how well balanced all the characters are—there really aren't any central heroes or villains. Everyone is given enough personality and takes a different view of the events in Neo Tokyo, so each conveys a different side of the story. Some of the more detailed elements of the comic's storyline were shortened or completely removed, in order to save time and streamline the project, but this never struck me as a negative thing. Certainly, the movie and the comic are almost two different worlds; one an attempt to interpret the other, and Akira does a good job in that respect. While I wouldn't say that I was introduced to Japanese anime by Akira, it was certainly the film that 'linked' many animation fans together. As a teenager, Akira was an experience; a bold coming-of-age ritual performed at midnight showings with folks who knew the dialogue by heart. A sort of Rocky Horror Picture Show for the children of the high tech, computer age. Its dark message spoke to many people, arguably a whole generation. Akira is not the greatest film ever made, but for what it wants to be, it achieves masterpiece status effortlessly, thanks to a solid combination of fantastic art and 'thinking' sci-fi elements. Image Transfer Review: This release has virtually nothing in common with previous VHS releases. The clean-up job has resulted in a stellar, pristine presention, with clarity and detail I simply have never seen in Akira before. It looks practically brand new in many ways. Colors are extremely rich and well balanced, without bleeding or any obvious fading (which was a major problem in the VHS versions), and everything is sharpened up. Much of the dirt and haze is gone, resulting in a far cleaner, more impressive image. While not all of the speckles and scratches are gone, the vast majority of them are, and I think most Akira fans will really be impressed. It is much like watching a new movie, given the rather weak condition we're used to. The cel animation really jumps off the screen in ways it never did before, and it's exciting to experience the film in such brilliant quality. Audio Transfer Review: While the original English dub for Akira is something of a cult favorite—mainly because it was so poorly done—it has been removed from this release to make room for a new voice cast, all of whom adhere to a new script, based on a much more accurate translation of the Japanese dialogue (which was also applied to the English subtitles). The end result is like a new movie, quite literally. Since the old dub was so inaccurate and 'soft', large amounts of subtlety and mature meaning in things were ruined, and you can only appreciate that fact by listening to this new dub. I generally don't like dubs, but this is an acceptable job that should certainly pass the muster of discriminating fans. Some controversy has been sparked over the fact that the English version got a new 5.1 treatment, while the original Japanese dialogue stayed in Dolby Surround. I have to admit, I don't really understand why both mixes weren't done in 5.1, as they obviously still had the original audio stems to create the English mix. So, why not the Japanese mix, which is the native language of the film? Well, luckily, this controversy is pretty much proven groundless: while there are differences in the two mixes, they're just not enough to moan about, and I doubt most fans will care, either. The 5.1 mix is pretty active and has some expanded high-end to it. It uses the surrounds to good effect, but doesn't overdo it. There is a lot of new foley and sound effects, though, and anyone who's seen Akira a number of times will be able to spot where minor changes were made. The Japanese 2.0 audio uses a lot of good stereo effects and directionality, along with some basic surround usage. It doesn't get quite as loud or fancy as the 5.1, but it seems to carry a bit more bass to it. It also lacks all of the substantial foley changes that the 5.1 has, so purists may like this track better. Both mixes are, for the most part, pretty equal in terms of overall quality. Complete storyboard progression with additional artwork and designs. Extras Review: While the first disc in the Special Edition set contains only the movie, it is accompanied by the "Capsule Option", a feature much like the "Follow The White Rabbit" feature on The Matrix. With the feature on, as you watch the film, a little capsule logo (like the one on Kaneda's jacket) will appear, and you push enter on the remote to access some information about the scene, usually production sketches and storyboard design. Unfortunately, the Capsule features are a bit few and far between. While the still shots within them are useful and interesting, much of the same type of material appears on the second disc in a format easier to access (the Production Materials). I was also disappointed that the Capsule feature did not have a separate index (a menu where you could see the material without having to scan the film). The supplements disc contains some very well chosen things to compliment the movie, beginning with an hour-long feature on the making of the film. Although originally produced in 1988, it's still a good program with interview footage and extensive details about the process of making the comic into a movie. It's in Japanese with English subtitles, and it has its own chapter index as well. A featurette on the Japanese musical group, Geinhoi Yamashirogumi, is included (also produced in 1988). This excited me, personally, as the soundtrack for Akira (widely available on CD) is an excellent collection of stylistic, experimental work that mixes traditional Japanese musical forms with a more modern touch. The featurette covers some facts about the group and how they came to compose for the film (coming up with the entire soundtrack before even one frame had filmed). The 1993 interview with Katsuhiro Otomo that was present on the Pioneer Laserdisc edition is featured, and it's a good, lengthy piece that allows Otomo to look back on the project with some experience and age behind him, rather than the nervous "I hope people like this" side of him we see in the 1988 interviews. It is in Japanese with English subtitles. The "Production Materials" section of the disc is where the real heart of the second disc lies. Here, you can basically "watch" the entire movie in storyboard format, with each scene drawn out and organized in minute detail. Also included are stills of conceptual art, background paintings, and character concepts. After the "movie" is over, there is an additional section featuring lots of unused work done for the film, and a gorgeous gallery of ALL of the original covers for the serialized publication of Akira, including the U.S. Marvel Comics version and subsequent re-publishings. Pioneer has added pictures of merchandise, CD covers, VHS covers and toys, etc. There is a lot of promotional material as well. There are three small featurettes that look at the process of mastering Akira to DVD. The first feature is a look at the restoration and repairing process the film underwent for the new digital master. The second has interviews with all of the new English voice cast and they're opinions on the movie, which is nice since, often, dubbing casts get little attention or respect for what they do. The third feature briefly discusses the audio construction process of creating the English 5.1 sound mix using the original materials and augmenting them with some new elements. If you're having trouble understanding or following something in the film, a hefty glossary section has lots of information and explanations about various topics and subjects, accompanied by small illustrations. Finally, a trailers section includes the original Japanese promotional campaigns, with optional English subtitles. While this was a screener copy (without external packaging and artwork), I can give a big thumbs-up to the menu design and basic presentation, which is awesome in many ways. Pioneer did a superb job capturing the look and feel of the movie without going overboard or doing anything too flashy. The menus for both discs contain great 5.1 audio and animation sequences, and one little touch I especially liked was how the audio selection menu actually plays clips of both the English and Japanese dialogue, depending on which you've selected. The supplements here were obviously chosen very carefully to be things that really spoke about the movie, rather than the "kitchen sink" attitude some discs tend to take. Everything here interested me and had something to do with the process of enjoying and understand the movie. As I understand it, Pioneer will also be making available a movie-only edition (which I don't think will include the Capsule option), as well a limited edition version in a tin case, which will come with some other goodies, but will not have any additional disc features. 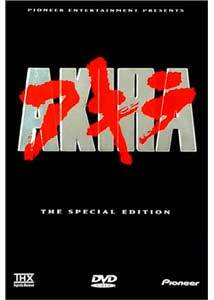 Akira is a film truly deserving a great special edition DVD; something with dignity and obvious effort. Pioneer certainly delivers the goods with what will be one of the most anticipated animation releases on DVD in perhaps the formats lifespan, so far. Akira launched a generation of people into the realm of anime and manga, and established itself as an icon for all that could be accomplished when creative minds set themselves to making epic-quality animation. Although the film omitted some elements from the comic to simplify things (as most adaptations do), the end result is still a landmark of world cinema.